There is no such thing as a super team, unless a super team is a team that refuses to lose when it has to win. Lots of teams have talented players on their roster but aren’t winning. 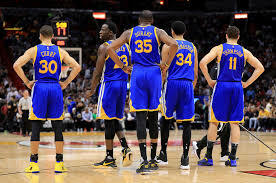 The term “Super team” is a low-key way of undermining what the Golden State Warriors are doing. The so-called experts gleefully fail to acknowledge that the Warriors are winning because their talented players play ego-free basketball. In an all eyes on me culture, the Warriors’ eyes are on the prize. They’re proving you get so much accomplished in life when you don’t care who gets the credit. The following are four other lessons we can all learn from this year’s Golden Warriors..
Warriors have two players in Kevin Durant and Steph Curry scoring 30 plus points each a game and either guy could be finals MVP. Yet they play selfless ball. Their team is loaded with talent, Draymond Green, Klay Thompson, Andre Iguodala. But their greatest talent isn’t ball skills; their greatest talent is their ability and commitment to playing team ball. They aren’t stuck on who’s the star. The star for the Golden State Warriors is winning. That is their daily goal in practice, meetings, film studies and the results show. So whether you’re on an IT team, nonprofit, corporate, education or service staff team, focus on how you can work together to create a great product, process, service and the results will be super. My mom told me many years ago, “Annie, when you want to accomplish anything in life, don’t look at people’s faces for approval or acceptance.” Kevin Durant left Oklahoma Thunder and never looked back. He’s been vilified, his character attacked and manhood questioned for his business decision as a free agent to join the Warriors. Yet, he stays focused and continues to be outstanding. This team has been undermined all season. When they win, they’re supposed to win. With the so-called experts saying they’re only winning because they have KD. But at one point OKC had KD, Westbrook and Harden, but for whatever reason, the team couldn’t get it done, and Harden left, then Durant. You can never underestimate importance of chemistry, sacrifice and teamwork. When Durant went to Golden State, it could’ve failed. With all that talent, there was no guarantee they would all gel together and make the mental sacrifices and game changes needed to win. They’re winning by shutting out the noise and focusing on exceeding their own expectations. So stop listening to what people who are not invested in your growth and success have to say. Focus on what you and your team, family, coworkers are trying to accomplish. Let the goal be the focus and the process will work. Putting the needs of the team first in a team environment is important to personal success. When the team wins, you win. The goal isn’t personal accolades. If you get a dozen triple doubles but your team falls short, it doesn’t matter. Focus on the process and productivity of team work and you’ll all reap the benefits, individually and collectively. Don’t get distracted. Don’t start believing your own hype. Don’t get sucked into the praise or criticism. Stay humble. Success can be as much a distraction as failure. Stay locked in and on task. Remember, when the goal is greatness, you will never arrived. Greatness is a process and a journey which requires patience, focus and humility. This entry was posted in Sports and tagged Annie Apple, Blogging, cleveland cavaliers, Golden State Warriors, Kevin Durant, Stephen Curry, Super Team.